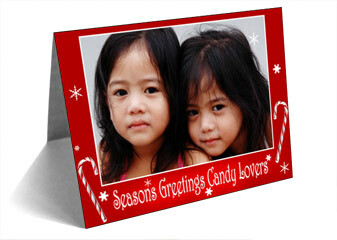 This quick and easy design is great if you want to send around a Christmas/Seasons Greeting. Or use it as a base to create your own masterpiece. Maybe add a photo of your family to it, to further personalise it. File >> Save as… and rename this psd something like email-greeting.psd and save. 2. Open your candy cane psd (Ctrl + O) that you created from the tutorial. If you created the 2 files as I suggested, then open candycane-flat.psd. You now will have 2 psds in your Photoshop window. What we want to do is duplicate the “cane” layer that you have just created into your new psd. Using your move tool, in your layer palette click on the “cane” layer and drag it on to the new “email-greeting” psd canvas. See image below. You should now have 2 layers in your email-greeting psd. Your layer palette should look like the image below. Keep your new email psd open and close your candy cane psd as we no longer need it. 3. Use your move tool to position the candy cane to the right of the design. 4. Click on the Layer Style button at the bottom of your layer palette (see image below) and choose “Drop Shadow. 5. Go to your layers palette and create a new layer ( ). Rename this layer “blue”. Drag in below the candy cane layer. Your layer palette should look like the image below. Take your paint bucket tool and fill the layer. Change to your eraser tool ( ) and select a dotty style brush, such as the “spatter” style. I’m using the Dry Brush Tip Light Flow. See image below. 6. Working around the outside of the blue, roughly erase the blue to reveal the white below. See image below left. Apply a blur. Blur >> Gaussian Blur (I used a blur radius of 30 pixels). Use the eraser again on the blue layer but this time stick closer to the edge. Try to drag the eraser in different angles to create an interesting scratchy look. 7. Create a new layer. Rename it “snowflakes”. Select your Custom Shape Tool. Make sure the setting at the top is set to Fill Pixels. Make sure Anti-alias is ticked. See image below. Hold down shft and click drag to create some different sized snowflakes. I think it looks great if they sort of disappear in to the white on the sides. See image below. 8. Select your type tool and type in your Christmas Greeting. I used the font “Girls are Weird” which you can download from www.1001freefonts.com. I used colour #0612C2 and varied the size of the fonts (merry=48px xmas=60px everyone!=60px). A good tip is to put each word on a separate layer so that you can design the layout better. Once you are happy with the layout, link the layers and then merge linked. 9. All done! 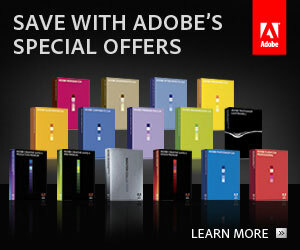 Now save your psd. 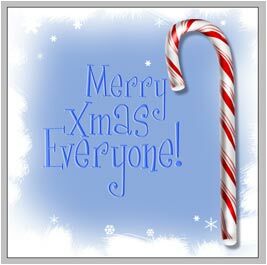 Now you can attach your Christmas Greeting to all your emails! 1. To get started open a new psd. You can see my settings in the image below. I’m creating a 5″x7″ card (which is one of the standard card sizes, another is 4″x8″). 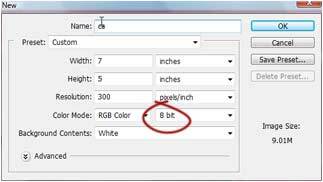 Also note that the colour mode is RGB and because we are going to create a high quality JPEG as the output, it is 8bit. 3. Open the photograph you want to use in Photoshop and copy the layer on to your new “card” psd. Don’t worry if it seems large on the canvas. Then close the original. 4. 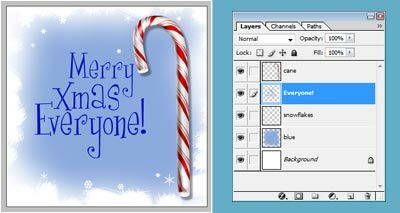 Open your candy cane design and copy it over to your “card” psd and close then close the original. 5. Now using Transform (Ctrl + T) make sure you hold down shift (to keep the scale equal and avoid weird distortions), scale down your original image and candy cane. Note I also chose to rotate my candy cane a little. You should definitely be scaling down i.e making your images smaller in proportion to your canvas…if you are scaling up your original image it is not big enough and is probably too poor of quality to continue (get a better sized image). I placed my second cane on the other side of the photo. See image below. 7. Create your holiday message using the text tool. I used the font Harrington at 72px, colour white (#FFFFFF), It still a little small so I increased the font 150% width wise and 300% in height. To do this use Window >> Character (and adjust options in the window). 10. Add some snowflakes using your custom shapes. A good idea is to create a new layer for each flake so that you can move them around individually and place in the exact spots you want. 11. Finally I created a new layer beneath the text layer. Painted in a white “scratchy” area using a Rough Round Bristle brush behind the text, applied Gaussian Blur and then changed the mode for this layer to Overlay. Finally save your psd. 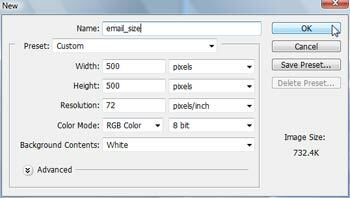 Then choose Save As…select JPG as the format and save at a quality high setting. I hope you found this Photoshop tutorial helpful. Feel free to contact me via my contact page if you have any questions.